During our small road trip through Eastern Spain we seized the occasion and drove through one of the most interesting wine regions of the moment. Priorato is located approximately 150 Km Southwest of Barcelona next to the river Ebro. The region is mostly mountainous and the vines are growing on rather steep slopes within a dramatic landscape. Taking the tiny roads can be dizzying, especially when they are winding around these steep slopes and a local follows closeby and nearly pushes your car. 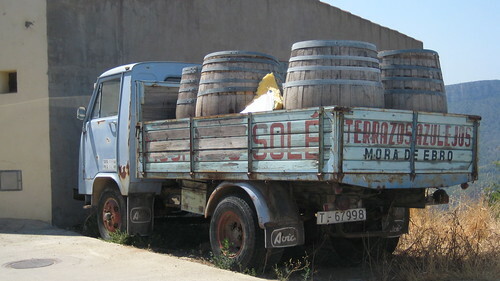 We drove through Gratallops, Torroja and Porrera, 3 villages where some famous winemakers such as René Barbier (Clos Mogador), Alvaro Palacios, Rotllan Torra and Cims de Porrera have their cellars.